Having started this post sometime in June, it was to be a bit of an update of what was on my stitching list for the summer. As often happens, unpredictable events take us from our routine schedule and force a re-prioritization of plans. Therefore the post never got published, and the motto "sew with the flow" became my daily mantra. A number of the projects below have been completed, progress was made on some, while others were not even touched. First up on the list of priorities was the whole cloth silk quilt that I'm making for my husband and myself. 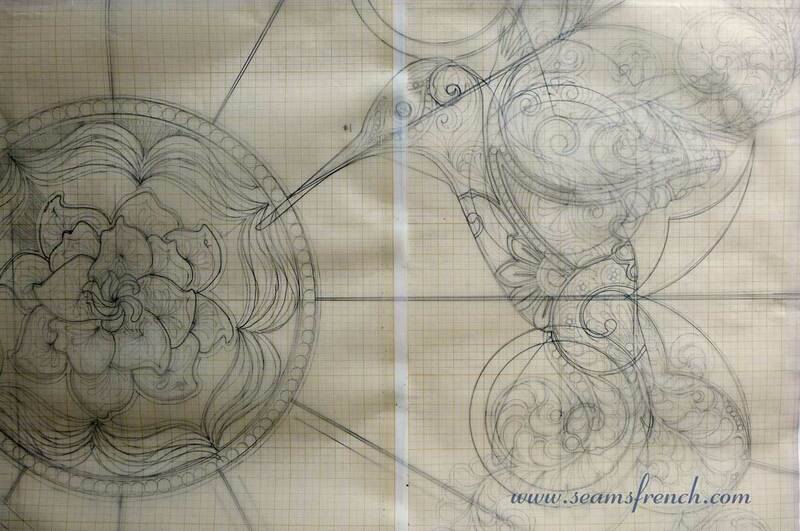 The design is well under way, and as soon as there is a large chunk of time, I will start transferring the pattern onto the silk. It will not be an easy task, but I'm very anxious to get going on it. Hummingbirds and gardenias are a major design element. 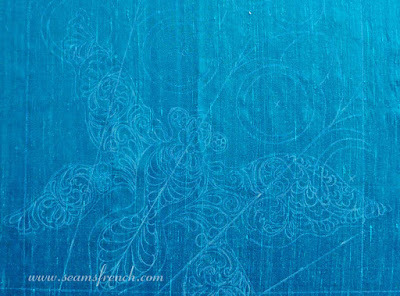 The top of the quilt is a teal dupioni silk (centre of the photo). On the back will be the dark navy/tealish Northcott cotton that is on the left. The turquoise solid cotton on the bottom right was an option for the back that I decided against. To see how it would hold up, I pre-washed a meter of the silk, which I am using for the trial pieces. Although there was shrinkage, it's not serious at all and I love how soft and manageable the silk has become. I will definitely be pre-washing the whole 9 yards. 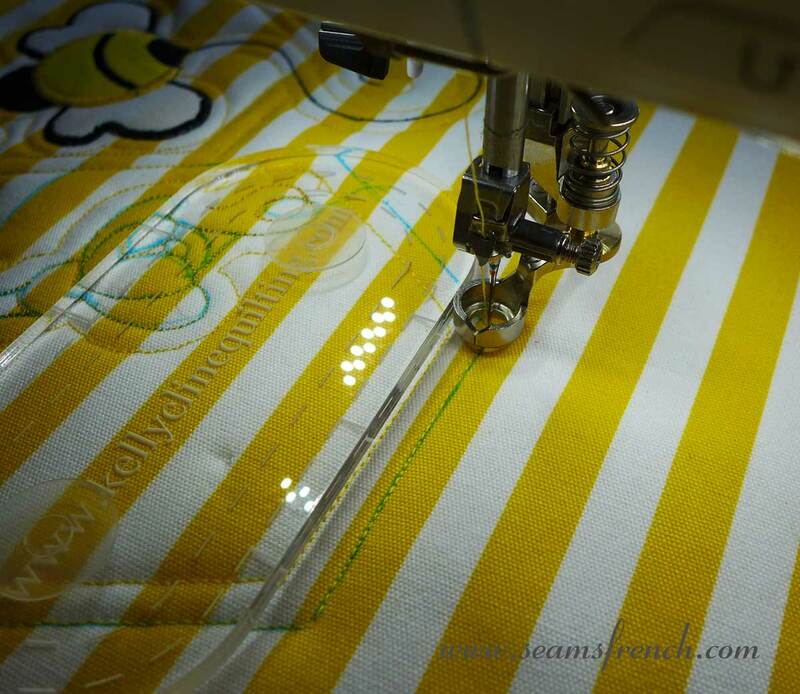 The trial piece has been underlined with a very light fusible interfacing. So far, I'm not crazy about the relief I'm getting with it, even though I'm using two layers of wool batting in some places. Will I regret it if I don't use it? In my on-going attempt to reduce the stash, I hauled out these 8 placemats that had been cut to size back in France, with applique templates ready to go. The bumble bees are machine appliqued and held in place with a light fusible web along with a satin stitch. They also gave me the opportunity to practice ruler work with my new ruler presser foot and "Kelly Cline's" machine quilting rulers. Along with the placemats that had been pre-cut were about 6 more meters of the yellow and white striped fabric, left over from a project in France. 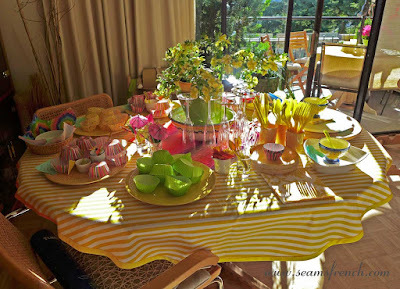 Tablecloths were an easy project that used up most of the fabric and became the colour inspiration for the table setting for our "Summer Solstice" party. As there was still a lot of fabric, I made a second tablecloth for our balcony table. The Lady H has graduated to a pillow, so new bedding was required, including these flannel pillowcases. 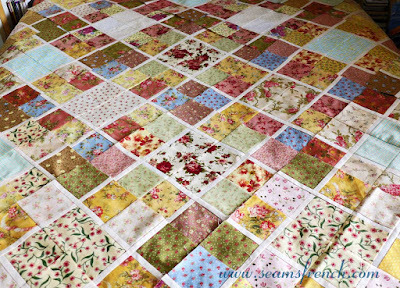 And last but not least, there was a little time to get my Scrap IV Flower Garden quilt from last year stitched together into rows. Another session should have the rows together and ready for sandwiching. The next post will be a bit of an update on Boutis, which is still very much a priority in my stitching life. You always do the most interesting projects! Your quilt will be magnificent. LOTS of work and difficult to transfer I am quite sure. 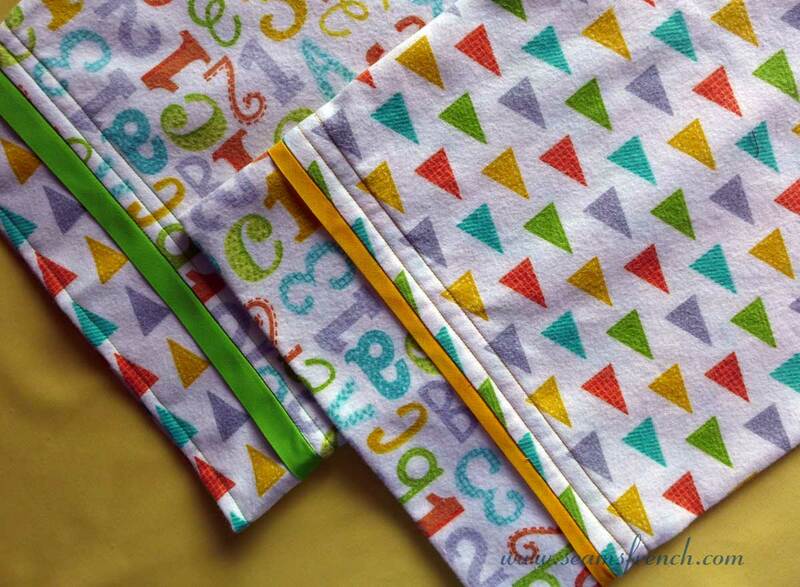 Perhaps the interfacing on the quilt sample prevents the relief you are looking for??? That is a guess...I don't have experience with it. 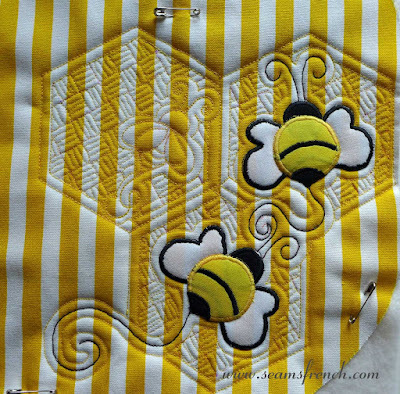 LOVE your "bee" placemats...quite creative! 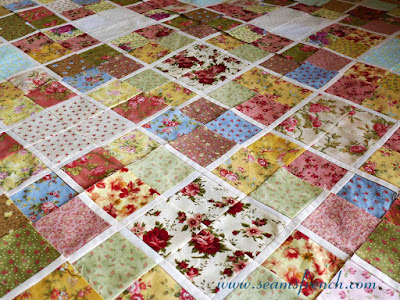 And the floral scrap quilt is really beautiful. How big is the scrap quilt? Lovely work as ALWAYS! Hi Karen. I can't remember the exact finished dimensions of the scrap quilt right now, but it easily covers our queen size bed and has a good drop on both sides. The placemats were a fun project that could be done in small chunks of time (that's all I have had for months) and easily cleaned up. I'm looking forward to focussing on the big quilt this month. (Fingers crossed). You Summer Solstice table looks amazing! I'm sure you all had a great time. 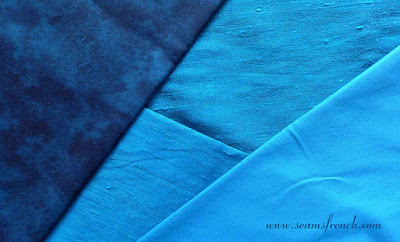 What about a knit fusible for the silk? Is bearding your main concern? I know some longarmers use a layer of cotton batting under wool batting. Maybe that would work better? In any case, it all looks great! Hi Monica. 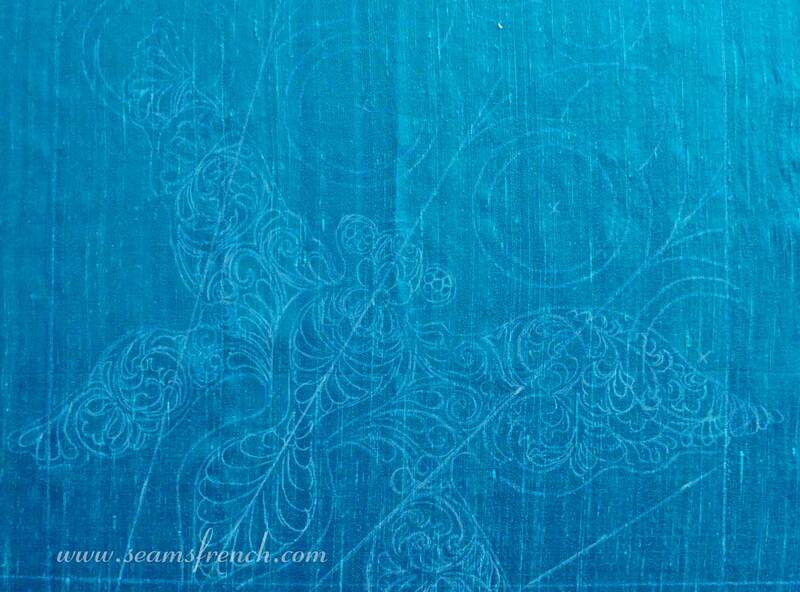 From what I understand, aside from bearding, if the FMQ is fairly dense, it can weaken the silk. I'm not sure that I want to risk that. I'm also going to try using a high loft poly batting along with the wool (for the trapunto areas) to see if that gives me better relief. I'm getting close to being ready to work on the actual quilt, so I'll have to decide soon. Thanks for your thoughts on the subject. Much appreciated. Last night I also remembered that Alex Anderson had a fusible that she specifically recommended for silk. Do you know it? It might be something TQS sells. I found your blog today while looking for inspiration on whole cloth quilting and I'm in love with your work! 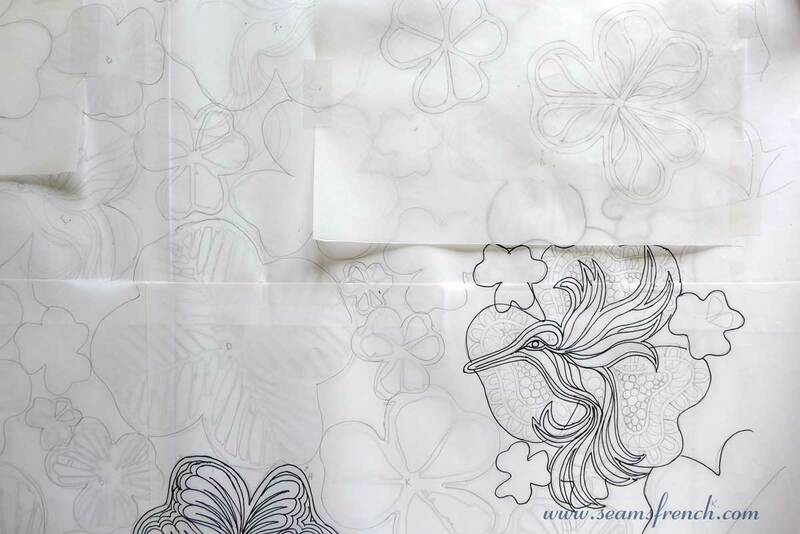 I've been reading back in an effort to find out which tools and techniques you use to transfer your designs to fabric. Is there a specific page on your blog for this? Thank you so much! Sorry, I somehow missed your comment. During the next few weeks, I will be posting progress reports on a whole cloth machine quilted project that I have just finished. I currently don't have specific pages on my blog, but I will try to link all of these posts together. Thanks for your visit.